Today we made the journey to the hospital where Leo was born. We walked through the doors that we carried him out of the day after he arrived in the world. Only now he was propelling himself, holding my hand and walking inside on his own accord. We were here for Leo's hearing test appointment. 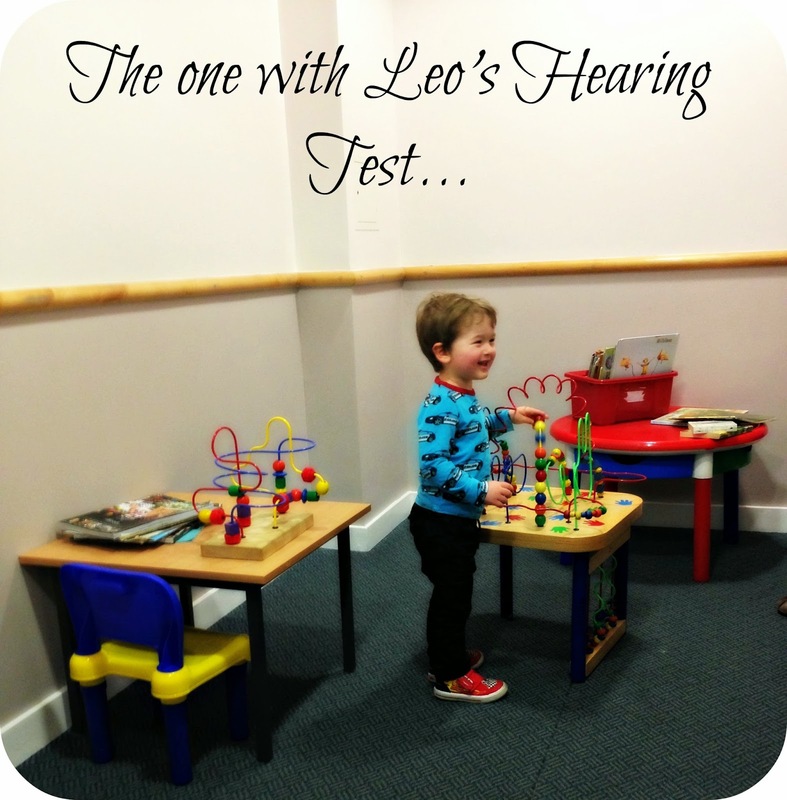 Following Leo's 2 and a half year check up in January we had wondered if Leo may not be hearing certain words correctly or not, and asked for an appointment. 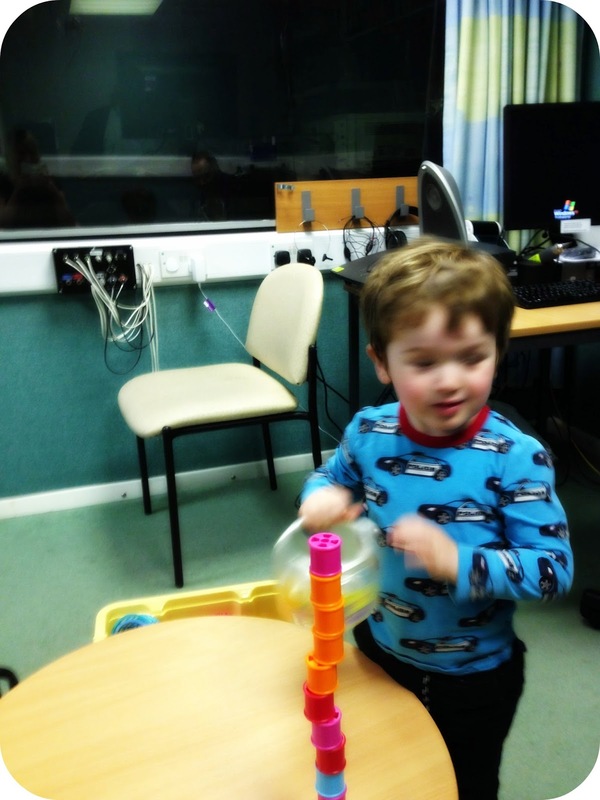 Our health visitor who has proved as much use as a chocolate fire guard informed us that we would only get this appointment if and when Leo was referred for speech therapy. I assumed that she changed her mind when the appointment slip came through the other month... But it turns out it was my GP who listened to me and made the appointment on my behalf. I had come armed with sweet bribery in the hope that this may spur my stubborn little toddler to play ball, even though deep down inside I knew that there was no buying Leo's co-operation.. But anything was worth a try to get us through the appointment. We sat in the waiting room for a few moments waiting for a names to be called, Leo played with the toys and made eyes at the family sitting closest to him. Soon enough Leo's name was called and he took my hand so that we could walk into the doctors office. The office was set up with a small table and chairs on either side, on the table were some toys. The lady began to talk to Leo and encouraged him to play with the toys. Firstly she wanted Leo to pop on a pair of headphones, but as my thoughts had anticipated.. Leo was having absolutely none of it! Not even when I donned them in the hope this may spur him on... Not even when we pulled out the bribery sweets! So with the headphone idea put behind us, the lady gave Leo free play. As he was playing and listening to the lady, another doctor played sounds into different parts of the room. The idea was that Leo would look in the direction that the sound came from. To hold Leo's interest when he looked in the right direction with each sound, there was a box either side of us and when he looked the right way, the box would light up and a cow or a pig would wiggle around. Once Leo saw this for the first time he wasn't very interested in the toys on the table... The lady had to convince him to stop waiting for the next sound and to carry on with their game. Before we left the appointment Leo decided to ransack the toy box and build a tower out of the cotton reels. He looked so pleased with himself as he stood there next to his creation. Leo did really well and looked in the right direction on all accounts, just like I knew he would. 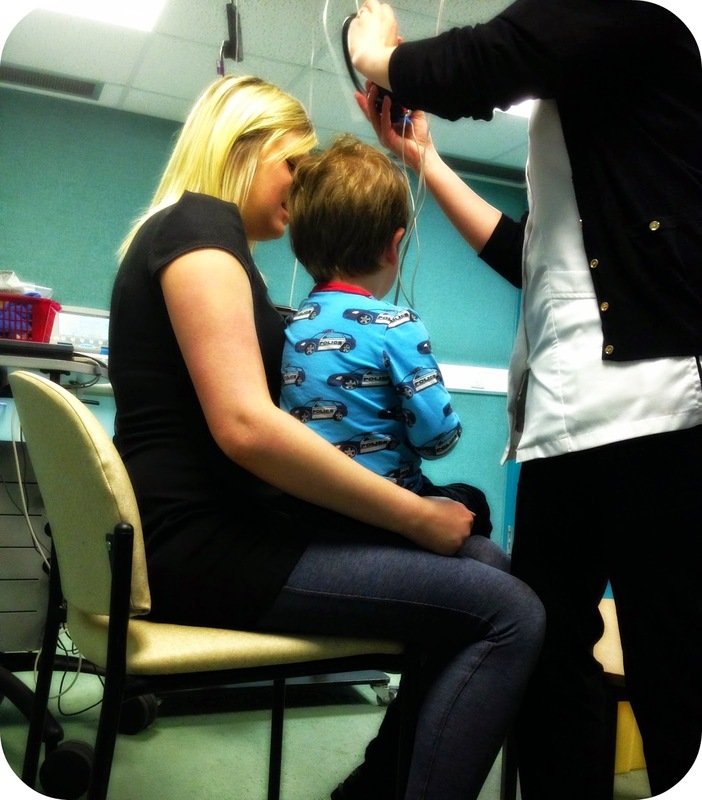 He passed the hearing test with flying colours and the doctor advised that she would be discharging him from further hearing tests. This lady told me everything that I knew already and to just give Leo time. He will come along with his words, just like he has been doing. She told me that if I have any firther concerns to just get in touch with our GP. I think now the next steps I will be taking is to call my GP, I would like to maybe discuss the option of speech therapy just as an extra aid. I figure that it can't do any harm to go along to these sessions, heck we both might learn something! So today I have confirmed what I already knew, but now I know that Leo does not have glue ear or any hearing problems. I just have to keep doing what I am doing, and watching this beautiful boy continuing to grow, learn and develop into a the most amazing little boy.